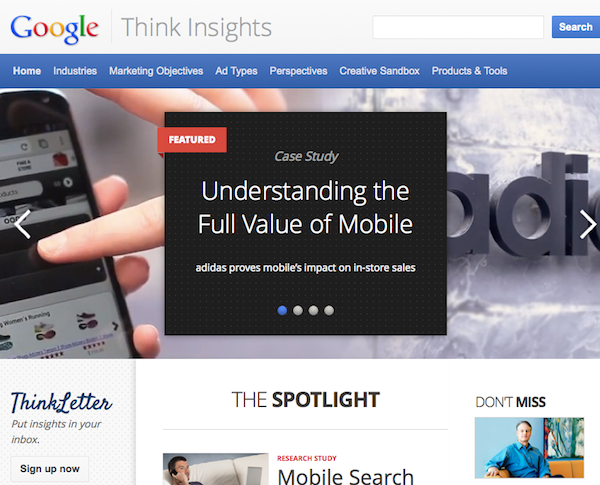 Last week, Google launched its updated Think Insights website. Maybe one reason it hasn’t been written about much is due to what some may have deemed a slow evolution of the concept since we first saw it in 2011. Google is no stranger to deprecation, as many of us have recently experienced from the phase-out of Google Reader. So when the company sees enough data and user feedback to justify a new iteration, it moves accordingly. Such is the case with the new Think Insights – aimed at providing one, definitive Google destination for digital marketers. Perhaps that goal, alone, merits our attention. In general, and in Google fashion, less is frequently more. The site is clearly built to scale, and the user experience benefits from what I like to call intentional redundancy. Ironically, it’s a “don’t make me think” approach to good website navigation, offering multiple paths to the same resources. You get the snippets upfront, with the options to dig deeper as desired. Nice work. So compelling is the idea of filtering insights by specific Marketing Objectives or Ad Types, the website actually provides faster access to these two attributes by also including them in the main navigation bar (accompanied by similar filters). The Perspectives link in the main navigation follows a consistent experience, placing greater focus on the articles, collections (similar to white papers), columns (by regular contributors) and interviews. It’s also helpful that several of these assets can be downloaded. The Creative Sandbox link in the main navigation leads to the showcase for sample marketing campaigns, and the Submit Your Work button stands front and center. One nice feature here is the ability to start a submission, then save your progress in the event you don’t have time to finish in one sitting. Note: it would be nice to also have the ability to submit your research. In addition to the common filtering attributes throughout the site, the Creative Sandbox section also enables a search for campaigns based on a brand or agency that submitted work. One unique filtering option in this area includes the ability to filter campaigns by use of technology. This is helpful if you wish to view only campaigns using YouTube or other Google products. Note: I wonder to what extent Google has thought about using their ad inventory to further promote this section of the site. This area alone could keep me inspired to contribute and regularly return. Finally, we get to the Products & Tools link, which for the most part is an eye-candied aggregate of onramps to spend (or justify spending) money with Google. Nothing evil here, just a summary display of commonly known platforms like search ads, YouTube, Google Analytics, etc. Google promises weekly updates to the site, but you can still subscribe to the RSS feed. You may also subscribe to a monthly round-up of the most popular content via the email Think Letter, join the conversation on the Think With Google Google+ page and follow Think With Google on Twitter.